Digital dental x-rays are an integral part of our safe dental care treatment plan. Lifetime Holistic Dental is committed to having the latest technology that keeps you as safe as possible, which is why we have invested in a state-of-the-art Cone Beam CT. This technology gives us the ability to diagnose conditions that other dental clinics just aren’t able to with the lowest radiation doses. A Cone Beam CT is a new type of dental 3D imaging which provides high resolution scans of the teeth, jaws and neck and face. The x-rays that it delivers are then used to create 3D images in specially designed software. 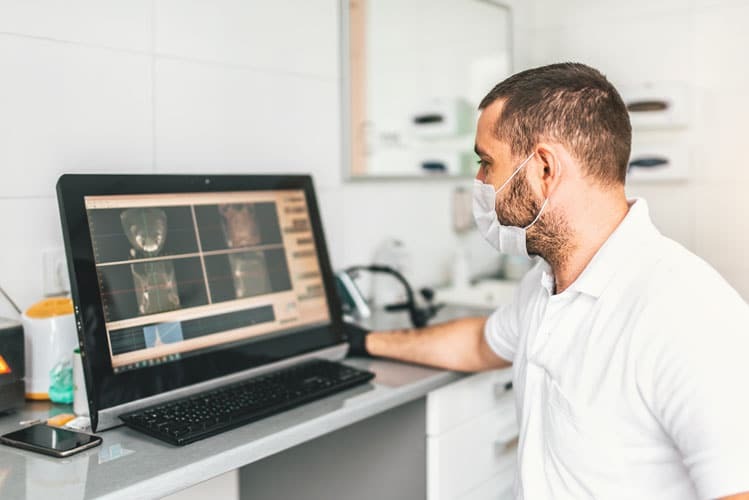 We can then see your teeth and the surrounding bones in an array of different views, enabling us to quickly diagnose and provide a higher quality of treatment. We only take essential x-rays that are consistent with our holistic dental approach. We see x-rays as a major part of our preventative dental care approach. X-rays allow us to see between the teeth and diagnose cavities as early as possible. This means we can then use non-invasive preventative treatments. This is always preferable to finding decay when it is further progressed and requires more invasive treatments. X-rays are essentially a form of electromagnetic radiation. They have a high energy level that can pass through the majority of objects, including human tissue. When x-rays travel through the air, and pass through your body, they create different shades of grey to produce an image on a special type of X-ray digital sensor. Detect dental cavities: The earlier we find cavities, the more likely we can use preventive regenerative approaches. The later, the more likely you will have pain, need a Root Canal or loose the tooth and the larger the cavities the more difficult the restoration process will be. Check the health of the tooth roots: Avoid root canals and gum disease by finding bacteria early. Identify gum or periodontal disease: If periodontal disease progresses too far, it is almost impossible to treat, and your teeth will fall out. Check how teeth are developing in young children: We monitor growth to ensure your children avoid invasive orthodontic procedures later on in life. We also monitor your child’s facial growth and development so as to prevent poor growth occurring. Keep an eye on the effectiveness of our preventative purposes. As an holistic dentist practice, we believe that detecting problems as early as possible is essential to protecting your overall body health. It allows us to intervene early, which usually means we can address the issue with as little disturbance to your mouth and associated structures as possible. Our goal is to prevent infections in your teeth, and gums and save you from very expensive treatments. How Do Cone Beam CT X-Rays Help Us Achieve This? Our state-of-the-art low dose cone beam CT generates 3D images of dental structures, soft tissues and even nerve paths within one scan. This means we can be far more precise in our treatment and locate minute problems that can quickly balloon. It also meets our standards by using far less radiation than conventional CT imaging. We can diagnose diseases within your jaw, your teeth, and even your sinuses, nasal cavity and the bone structures that make up your face. The procedure only takes 10-15 seconds and we’re left with incredible images that give us all the information we need so we can completely plan your treatment. Why Choose Us for Digital X-Rays?